* Recommended processing solvents for M214 are chlorobenzene and dichlorobenzene. PTB7 for high-performance organic photovoltaics. 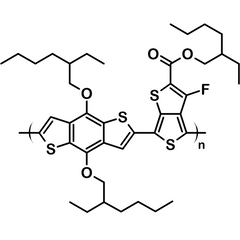 Poly[[4,8-bis[(2-ethylhexyl)oxy]benzo[1,2-b:4,5-b']dithiophene-2,6-diyl][3-fluoro-2-[(2-ethylhexyl)carbonyl]thieno[3,4-b]thiophenediyl]], more commonly known as PTB7. In stock now for immediate dispatch worldwide. PTB7 gives some of the highest reported efficiencies for polymer:fullerene solar cells due to its extended absorption into the near infra-red and lower HOMO level. Together with our complete package of processing information, PTB7 becomes a quick and easy way to improve device efficiencies. This represents a cost-effective method to increase performance and impact of devices and data for a wide range of OPV related research. 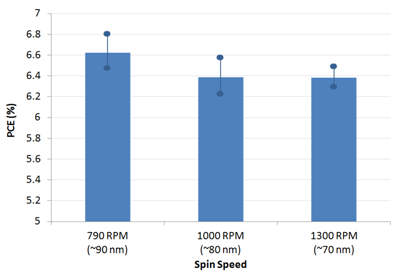 At typical concentrations for spin-coated devices of 10 mg/ml, a standard batch of 100 mg will produce 10 ml of ink - enough to coat 200 of Ossila's standard sized substrates even assuming 50% ink loss during preparation and filtration. At concentrations of 1 mg/ml (more typical for ink-jet printing and spray coating) up to 100 ml of ink can be produced. 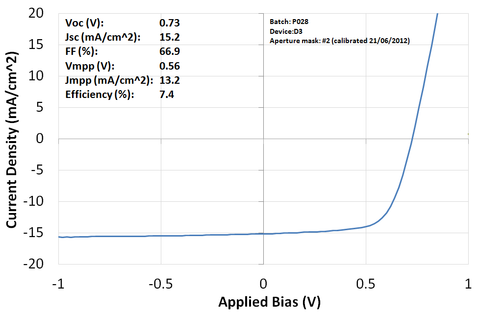 In a standardised reference architecture (using a PEDOT:PSS hole interface and Ca/Al electron interface) we have shown this batch to give a PCE of 6.8% (see data sheet below) and up to 7.4% using PFN. By using new interface materials and architectures PTB7 has been shown to reach efficiencies of 9.2% PCE in the literature [1,2]. The high solubility in a wide range of solvents makes ink preparation and filtration simple, and PTB7 is one of the easiest materials we have ever worked with (simply shake it to dissolve). This also makes it an excellent candidate for a variety of coating techniques including ink-jet printing, spray coating and blade coating. For information on processing please see our specific fabrication details for PTB7, general fabrication video, general fabrication guide, optical modelling paper on our standard architecture , or email us for any additional help and support. Enhanced power-conversion efficiency in polymer solar cells using an inverted device structure Zhicai He et al., Nature Photonics, V 6, p591–595 (2012). Simultaneous Enhancement of Open-Circuit Voltage, Short-Circuit Current Density, and Fill Factor in Polymer Solar Cells Zhicai He et al., Advanced Materials, V 23, p4636–4643 (2011). Designing ternary blend bulk heterojunction solar cells with reduced carrier recombination and a fill factor of 77%, N. Gasparini et al, Nat. Energy, 16118 (2016); doi:10.1038/nenergy.2016.118 (Ossila PTB7 was featured in this paper). 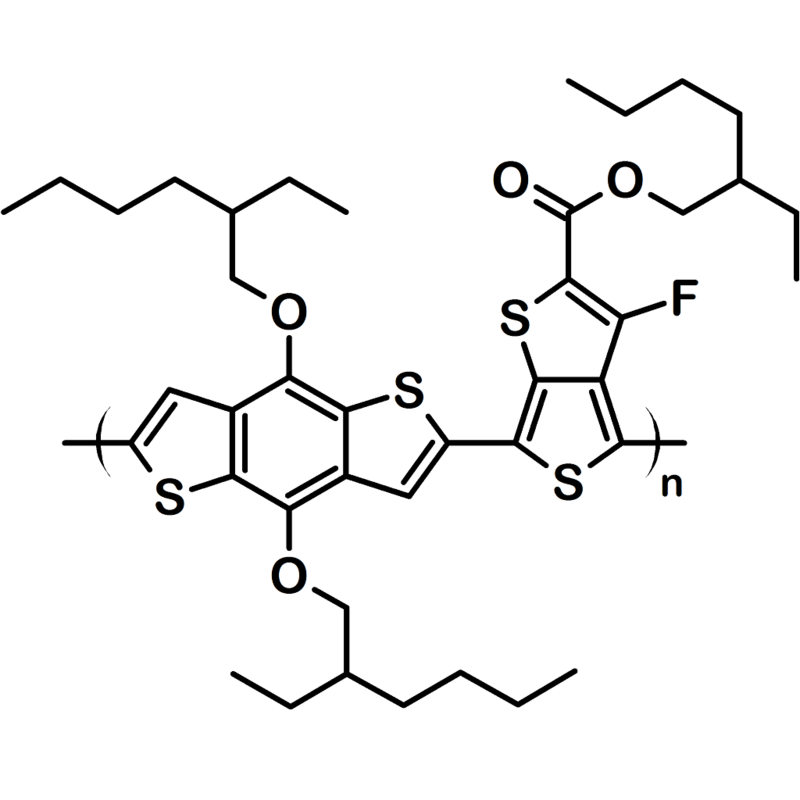 Chemical structure of PTB7; Chemical formula (C41H53FO4S4)n.
Reference device were made on batch M211 to assess the effect of PTB7:PC70BM active layer thickness on OPV efficiency using an inverted architecture with the below structure. These consisted of the below structure and were fabricated under inert atmosphere (glovebox) before encapsulation and measurement under ambient conditions. For generic details please see the general fabrication guide and video. 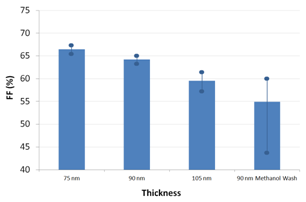 For specific details please see the below condensed fabrication report which details the optical modelling and optimisation of the multilayer stack. 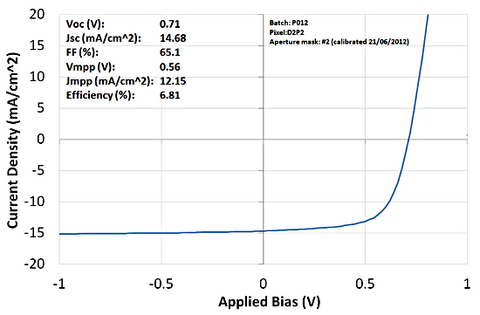 Previously it has been shown that PFN of around 6.5 nm gives optimum performance [1-3,P021] while modelling has shown that an Al back cathode gives higher performance than Ag when used with MoOx . The PTB7:PC70BM solution was made in chlorobenzene at 25 mg/ml before being diluted with 3% diiodooctane (DIO) to promote the correct morphology. 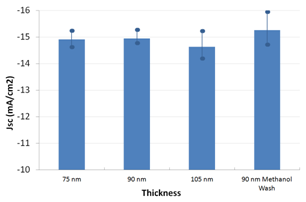 Active layer thicknesses of 75 nm, 90 nm and 105 nm were chosen corresponding to the lower, middle and upper end of the "thin film" absorption peak of a typical stack as predicted by optical modelling . For each of these thickness a total of four substrates was produced, each with 4 pixels and the data presented below represents a non-subjective (no human intervention) analysis of the best 75% of pixels by PCE (12 pixels for each condition). An additional two substrates were also prepared with a methanol wash to help remove the DIO as has been reported in the literature to help improve performance. 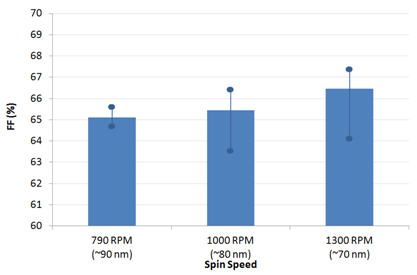 Overall, the maximum efficiency of 7.2% average PCE (7.4% maximum) was found at 75 nm film thickness. 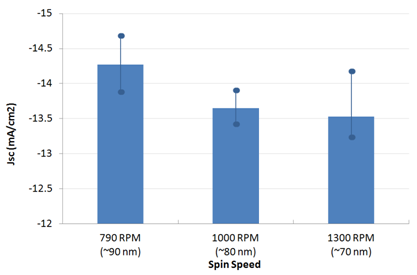 Figure 1: PCE, Jsc, Voc and FF for inverted architecture devices at different spin speeds. Data shown is averaged with max and min overlaid with filled circles (please see note of Dektak measurements). 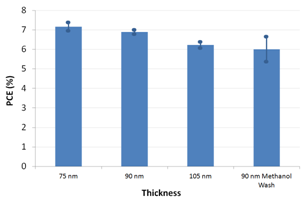 As previously reported [1,2,3], films of approximately 90 nm give the highest performance with greater Jsc and only minor loss in fill factor. Figure 2: The JV curve for the best performing device - inverted architecture. We normally calibrate thin films by use of a Dektak surface profiler, however the use of DIO results in an enhanced level of uncertainty in the film as the DIO will take several hours to fully dry under normal conditions and is likely to undergo some slight further shrinkage when placed in vacuum. The DIO can also be removed by baking the substrate on the hotplate at 80°C for about 10 mins which can be useful for doing quick measurements but also drives excess phase separation between the polymer and PCBM making it unsuitable for device work. Due to the very high solubility of the PTB7 it was noted during fabrication that the film changed colour when in contact with the Ossila encapsulation epoxy in liquid form for extended periods indicating that there was some miscibility. Inspection of the active areas underneath the top cathode indicated that the epoxy had not seeped into the active area before curing and device metrics indicate that this did not appear to affect performance. However, we would recommend minimising contact time between the epoxy and PTB7 films before UV curing. Methanol devices spun for 30 seconds, then coated with 50 μl methanol by static dispense then spun at 2000 rpm for 30 seconds. Left in chamber over the weekend and evaporated with the below parameters. Reference device were made on batch M211 using a standardised architecture for comparative measurements using Ossila standard substrates and materials. These consisted of the below structure and were fabricated under inert atmosphere (glovebox) before encapsulation and measurement under ambient conditions. For generic details please see the fabrication guide and video. For specific details please see the below condensed fabrication report and also Watters et al. which details the optical modelling and optimisation of the multilayer stack. For this standard reference architecture an average PCE of 6.6% was achieved for the optimised thickness with a peak efficiency of 6.8%. Note that no other optimisation was performed (blend ratio, DIO concentration, drying conditions etc) and so further small improvements may be obtained by varying these conditions and significant improvements obtained by using alternative interface materials [1,2]. 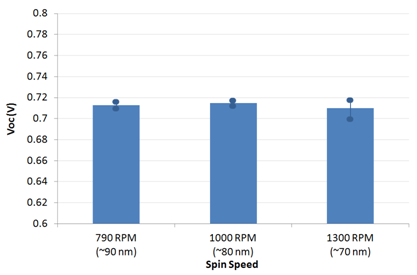 Figure 3: PCE, Jsc, Voc and FF for standard architecture devices at different spin speeds. Data shown is averaged with max and min overlaid with filled circles (please see note of Dektak measurements). 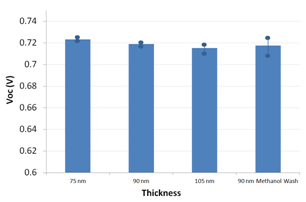 As previously reported [1,2,3], films of approximately 90 nm give the highest performance with greater Jsc and only minor loss in fill factor. Figure 4: The JV curve for the best performing device - standard architecture. Due to the very high solubility of the PTB7 it was noted during fabrication that the film changed colour when in contact with the EE1 encapsulation epoxy in liquid form for extended periods indicating that there was some miscibility. Inspection of the active areas underneath the top cathode indicated that the epoxy had not seeped into the active area before curing and device metrics indicate that this did not appear to affect performance. However, we would recommend minimising contact time between the epoxy and PTB7 films before UV curing. Transferred to glovebox when all samples spun.